82 rods south of this spot was born in a log cabin May 16, 1836 George H. Page. The first white child born in Palmyra Town. Location. 41° 51.706′ N, 89° 33.488′ W. Marker is near Dixon, Illinois, in Lee County. 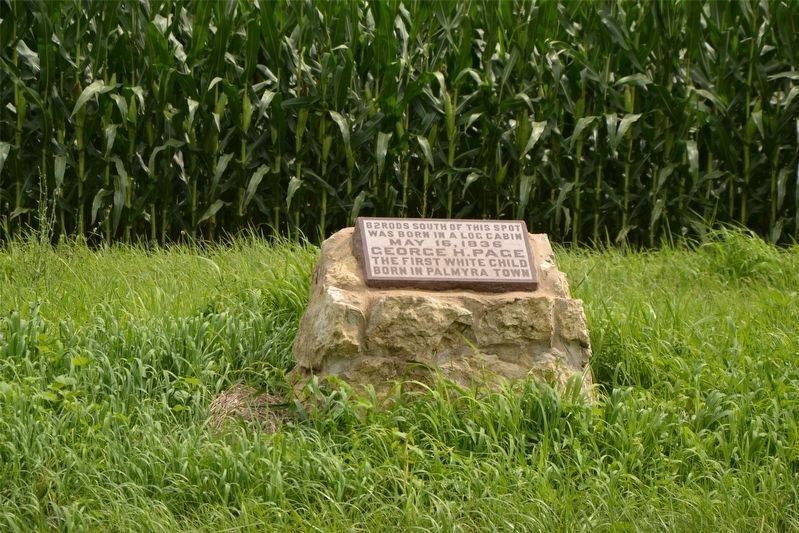 Marker is on Palmyra Road 0.6 miles west of Sugar Grove Road, on the right when traveling east. Touch for map. Marker is in this post office area: Dixon IL 61021, United States of America. Touch for directions. Other nearby markers. At least 8 other markers are within 5 miles of this marker, measured as the crow flies. Dixon Memorial Swimming Pool (approx. 3.2 miles away); Abraham Lincoln (approx. 3.9 miles away); First Christian Church (approx. 4.1 miles away); Dixon Public Library (approx. 4.1 miles away); The Wings of Peace and Freedom (approx. 4.1 miles away); Berlin Wall Replica (approx. 4.1 miles away); Dixon Historic Center (approx. 4.2 miles away); Lincoln Supports Fremont for President (approx. 4.2 miles away). Touch for a list and map of all markers in Dixon. Regarding 82 Rods South of This Spot Was Born in a Log Cabin. The marker likely means "Palmyra Township." George Ham Page died on April 20, 1899 and is buried in Palmyra cemetery, approximately 1 mile north of where he was born. Page was a successful businessman who established a condensed milk factory in Switzerland in the 1860s. More. Search the internet for 82 Rods South of This Spot Was Born in a Log Cabin. Credits. This page was last revised on March 25, 2019. This page originally submitted on March 22, 2019. This page has been viewed 31 times since then. Photo 1. submitted on March 22, 2019. • Bill Pfingsten was the editor who published this page.